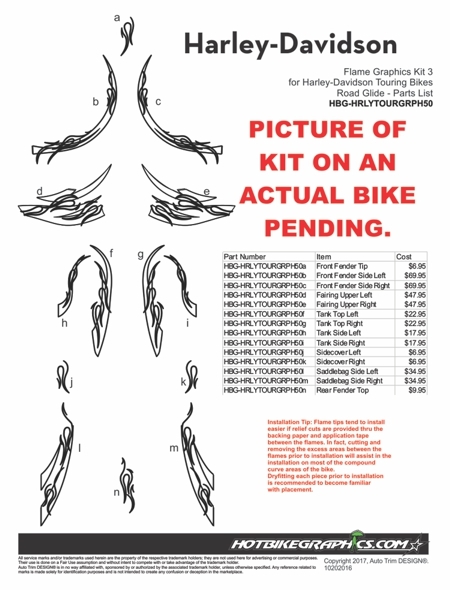 Set your bike apart from the rest with this great-looking fourteen (14) piece Flame Graphics kit! Screamin' Eagle inspired design elements of this kit include a Dark or Bright Simulated Brushed Metal background, light wisps of smoke and traditional Bright Orange or Blue Flame pins. The graphics look so good, you'd think they're factory applied! While the graphics are designed and shown here on a 2016 Harley-Davidson Road Glide, perhaps with slight trimming, will look great on just about any bike. Digitally printed with our DuraCOLOR graphic technology, kit is manufactured with premium automotive grade vinyl film materials. As a further step, graphic is covered with a 2 mil clear laminate which provides protection from miles of abuse. Screamin' Eagle is a trademark of H-D Michigan, LLC. Auto Trim DESIGN® is not affiliated or otherwise connected with H-D Michigan, LLC.